Besides spin qubits, our lab has worked on other topics in mesoscopic device physics, including graphene and complex oxide interfaces. Below, we highlight some of this past work, as well as touch on Lieven’s background in NMR qubits. 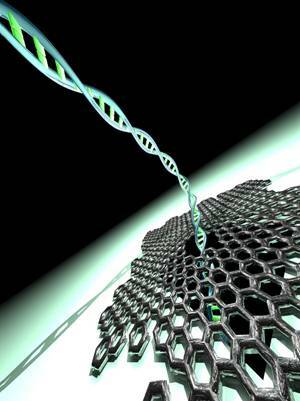 Graphene is a Nobel prize winning material formed by a hexagonal lattice of carbon atoms just one atom thick. Electrons in graphene behave as if they were massless relativistic particles, leading to extraordinary electronic properties. We have explored these properties experimentally with an emphasis on mesoscopic devices at low-temperature, where quantum mechanical effects become important. Examples include proximity-induced supercurrents, quantum confinement, electric-field induced band gaps, and Aharonov-Bohm oscillations. A second research direction has been to exploit the unique two-dimensionality of graphene for fundamental studies and novel devices, ranging from from DNA translocation to graphene electrodes for contacting and measuring individual molecules. We have studied the quantum confinement of Dirac particles in gate-defined quantum dots in graphene, in part motivated by the prospect of highly coherent spin qubits. 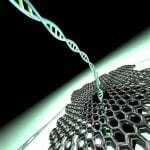 A holy grail in single-molecule experiments based on nanopores is to resolve individual bases in a DNA molecule as it passes through the pore. What is required is a pore in an atomically thin membrane. 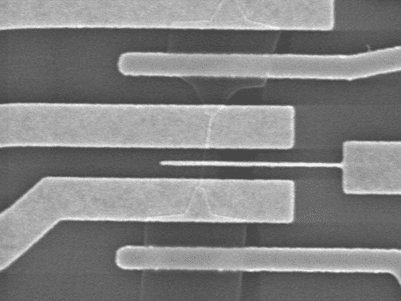 Single layer graphene and undoped bilayer graphene (with Bernal stacking) are zero-gap semiconductors. This makes it difficult to confine the particles or cretae transistors in such materials. 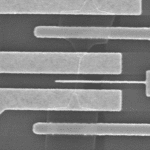 We fabricated mesoscopic superconducting junctions by contacting a graphene layer by two closely spaced superconducting electrodes. We observed a supercurrent that is carried by either electrons in the conduction band or by holes in the valence band, tuneable by gate voltage. This supercurrent persists at the Dirac point. We have studied, in collaboration with the Caviglialab, devices fabricated using a class of materials known as complex oxides. These materials can exhibit a diverse variety of electronic properties including magnetism and superconductivity. See e.g. 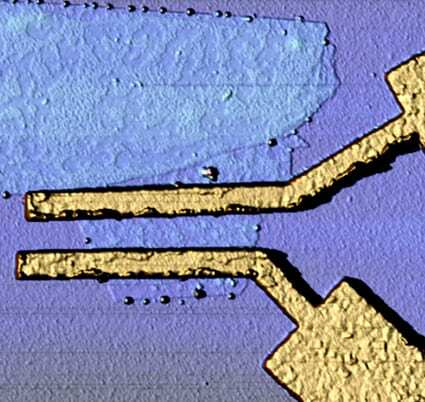 NanoLetters 15, 2627 (2015) or Nature Nano 11, 861 (2016) and this piece by phys.org. Lieven carried out most of his PhD research as a student at Stanford University at the IBM Almaden Research Center in San Jose, CA. As a PhD student, he used the spins of atomic nuclei in a molecule as quantum bits and implemented various quantum algorithms for the first time. Most famously, he demonstrated Shor’s quantum algorithm for finding the prime factors of the number fifteen on this NMR platform (Nature 414, 883-887). Further material on this and the early years of experimental quantum computing efforts will be added soon.